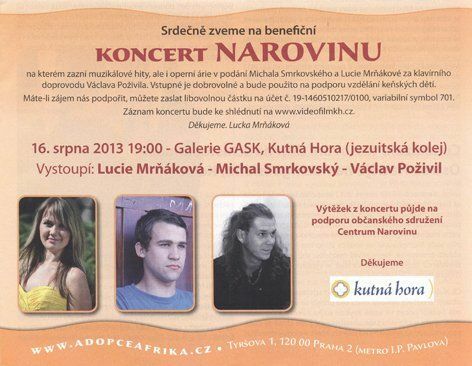 We are pleased to invite you to a beneficial concert given for the Narovinu Centre. The concert is organized by Lucie Mrnakova and her friends and will take place at Kutna Hora (a historical town close to Prague) on August 16, 2013. Musical hits as well as opera arias will be performed by Michal Smrkovský and Lucy Mrnakova to the accompaniment of the piano by Vaclav Pozivil.